Lester Goran was born in Pittsburgh in 1928. Growing up in the slums of Pittsburgh’s Oakland section, Goran found solace and comfort with his pen and paper. Upon publication of his first novel, The Paratrooper of Mechanic Avenue, the New Yorker attributed to Goran “the vitality and true perspective of a born novelist” and said his “first novel gives reason for rejoicing.” Goran has now published eight novels, and three short story collections, including Tales from the Irish Club, a New York Times Notable Book in 1996. 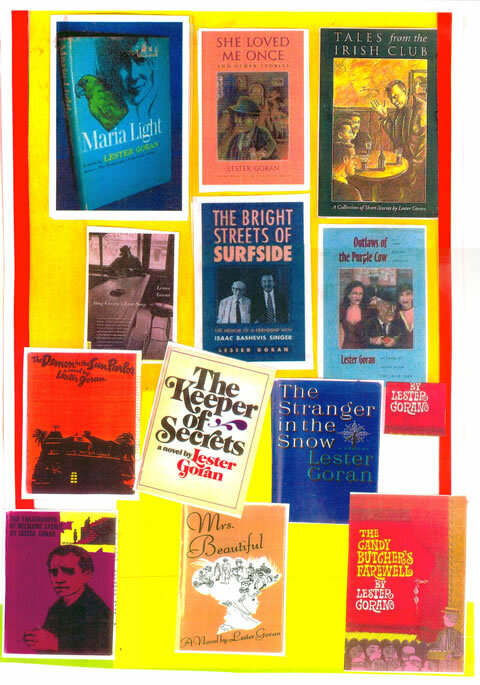 Goran memorialized his ten years teaching with and translating for the Pulitzer Prize-winning author Isaac Bashevis Singer in his memoir The Bright Streets of Surfside (1994). On writing, Goran says, "Sometimes I think that everything I've ever seen or heard has little other purpose than to be shaped into a novel. I have been around soldiers and politicians, burlesque people and teachers, gamblers, barbers, businessmen, housewives - everywhere the hustle is on for about thirty cents worth of affection and one more dollar. I have stood on the edges (but sometimes in the middle) listening, dusting dirt from the shoulders of old suits, delivering a pitch, contemplating love, Shakespeare, Henry James, or Sean O'Casey. I wonder that everyone who has ever learned the alphabet hasn't decided that the world is a novel. It is a large incomprehensible, exciting world. I am glad I write it in." The fall of 2010 marks Lester Goran’s fiftieth year teaching at the University of Miami. To recognize this milestone, the Creative Writing department at the University of Miami will honor this icon’s illustrious writing and teaching career with the inauguration of the Lester Goran Scholarship fund.